Is it so weird to have the hots for a man in his seventies? 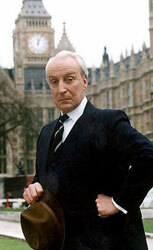 If it's Ian Richardson you speak of, of course not! Why else is he always playing the scheming debonair wife stealer and/or seducer? He brings grace and charm and his own spell of alluring aristocracy to his all of roles, even his most famous stateside performance as the Grey Poupon man–the fact that he is best known for that here is disgraceful. I am so sad to say that Mr. Richardson died this month, and that commercial was listed highest on his achievements. Bah! Just watch this week's TV pick, or previous pick Tinker, Tailor, Soldier, Spy, or the more recent Murder Rooms. There you will see what a talent he was and you will agree that he is devilishly handsome and undeniably attractive.